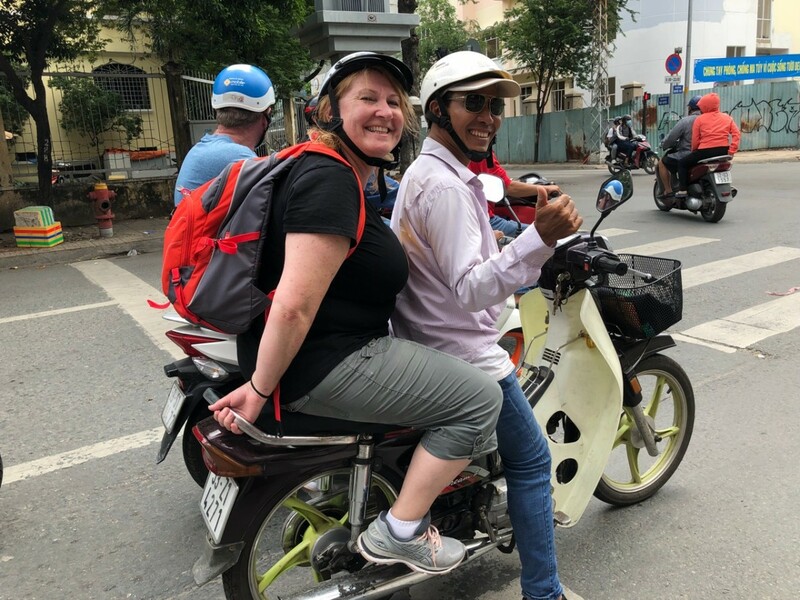 Scooting around Saigon – The Epicurious Wanderers! The last few days have been fairly busy, well busy considering we’re on holiday. On Monday we caught up with Adam, he was our tour leader in Cambodia a few years ago. He lives in Saigon, well for a few more days at least, as he’s heading back to Brisbane with his family. 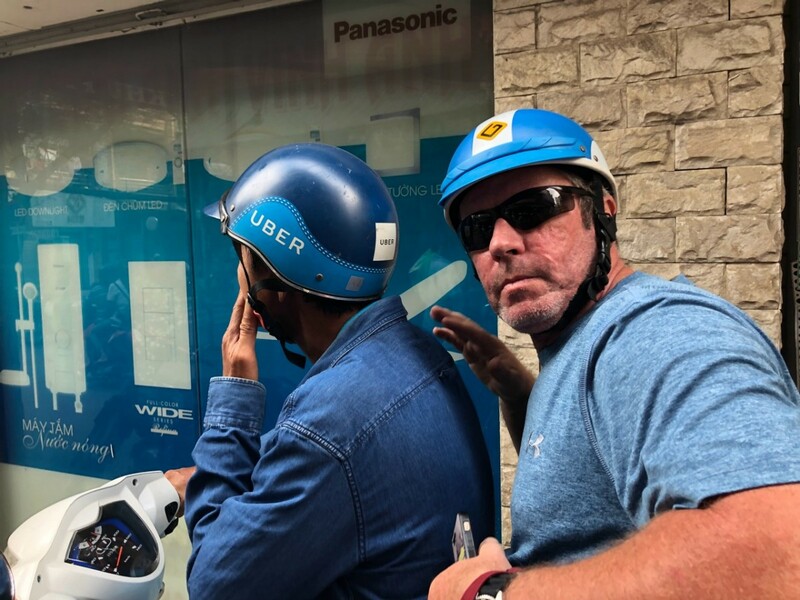 He runs scooter tours of Saigon, amongst other things, so we jumped on the back of scooters and hit the road. The first moments are quite wild, it’s one thing to watch the traffic, but quite another to be part of it. You soon relax though as you realise the guys riding the scooters have been doing this for years. My rider, Mr Sal, keeps up a running commentary as we zip in and out of the traffic. As I get more comfortable on the back I start taking pictures of what’s going on around us. First stop is a local market, not aimed at tourists but more for the locals to do their daily shop. Everything is on offer from fruit and veg to meat and all sorts of seafood. As you wander the narrow walkways you need to keep an eye open for scooters, takes drive through shopping to a whole new level. After the market it’s coffee time, if you’ve never tried Vietnamese coffee you’re missing out. Our favourite version is Phin Sua Da, Vietnamese iced coffee with condensed milk, very tasty. 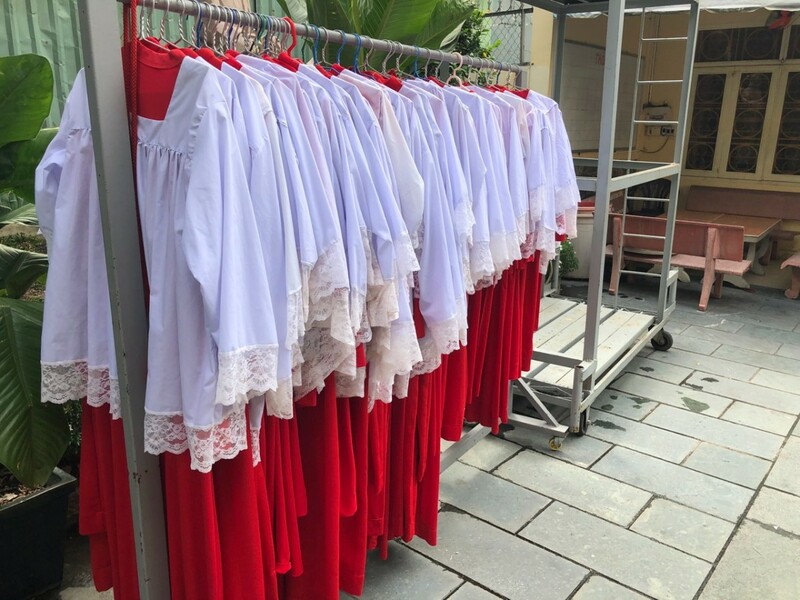 After our break we visit some local churches and temples, religion plays a huge role in Vietnamese society. 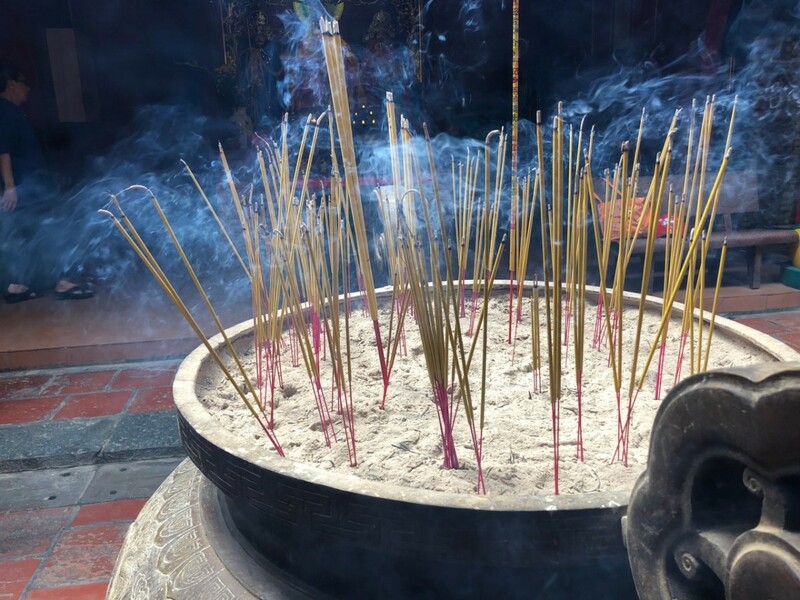 We see some amazing Catholic Churches as well as Buddhist temples, our riders each seem to follow a different religion and each is keen to show us his place of worship. No matter where we ride though one thing stands out, that is the laughter coming from behind. Helen’s chauffeur is the comedian of the group, there is just constant laughter from both of them. We also stop at a floating market, it’s a little quiet today though, here people from along the the Mekong gather to sell their produce then make the journey home to start the cycle again. The boats are in all conditions , some look as though a gentle wave would finish them off. Another highlight on the ride is a visit to the ‘motorcycle market’ area in Chinatown. All sorts of parts for bikes are sold here, you could easily walk in empty handed and walk out with the parts to build your own bike. We finish the tour with lunch at a small eatery, we decide on Bun Cha. A simple dish of noodles, a light broth, pork and fresh herbs. A great way to finish a top morning, sitting on a little wooden stool, watching the world go by with some fresh local food. The rest of the day was spent wandering around just soaking up this amazing city. On Tuesday we were supposed to do a Pho Breakfast Walking Tour, we cancelled though as we’re both still suffering with head colds and couldn’t face another early start. It’s no fun being sick on holiday! Tuesday then become a day of strolling the streets and watching the world go by. We find a few little cafes to stop at, there’s no shortage of them. A visit to a local brewery is called for as well, so we head to Heart of Darkness. OMG, this place is amazing, so many beers in such a small taproom. 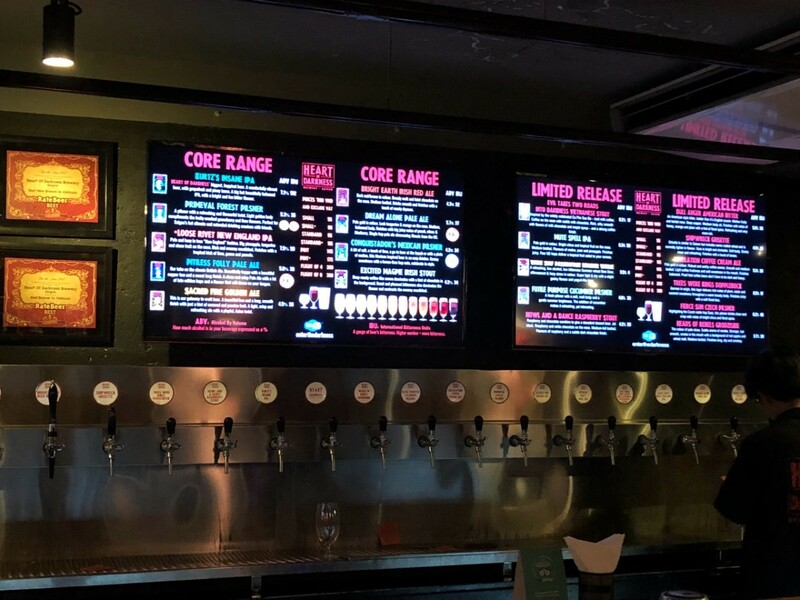 They have 20 taps of amazingness, we did visit twice and on the second visit they changed a few taps to new brews, I think I managed to try about 10 or 12 of the beers. Our wandering also took us to the Helo bar on the 53rd floor of the Bitexco building, time for a few cocktails in the sky. From here we wandered the streets until we found Lemongrass, a highly recommended restaurant in Ho Chi Minh City. Our last night in Ho Chi Minh City saw a return visit to Heart of Darkness and then a comfort food stop at Pho24 for a big bowl of Vietnamese goodness. Cheap and nourishing way to round of our visit to this crazy, hectic, amazing city. 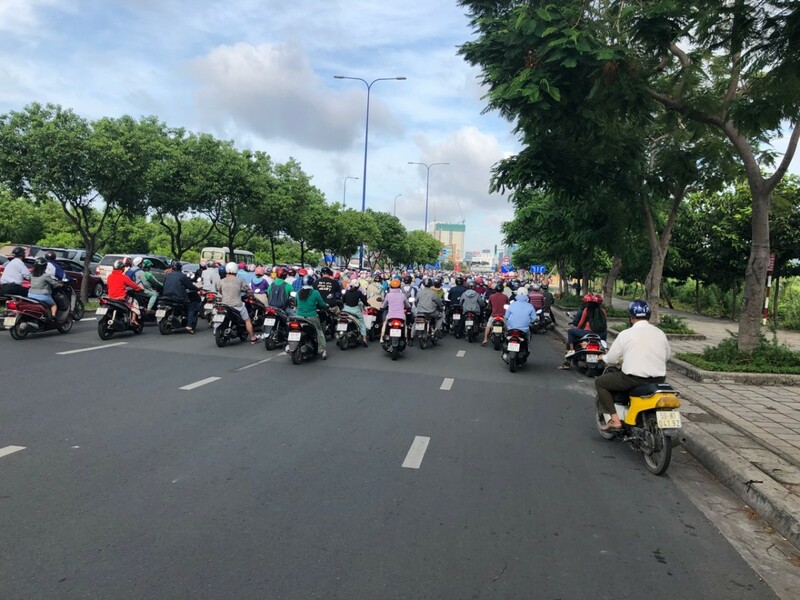 Next stop is Hoi An…. I had the funniest scooter rider. He was always laughing & smiling. Hout (not sure of the spelling). Also spent his chilling the Cu Chi tunnels. I feel very pleased to have met him.